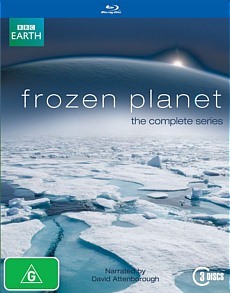 Frozen Planet Blu-ray Review. David Attenborough has really mastered his craft – His latest is one of his best. Frozen Planet is a must for nature lovers as well people who just want to be awed and lost in the grandeur of this planet for an hour or so. David Attenborough has this uncanny ability to make the mundane absolutely enthralling. His new series Frozen Planet takes the viewer on a journey around the two poles as he brings us stunning views of the wildlife, the environment and the people. The images are in crisp 1080i with a stirring instrumental sound track. The sound track unfortunately, is adequate, but only in Dolby Digital 2.0. At the end of the episodes are small making-of vignettes, well worth the watch and allows us a fascinating glance into the struggles that took place making this series. There also is a special menu and sound track for the visually impaired. David Attenborough has really mastered his craft – His latest is one of his best. Frozen Planet is a must for nature lovers as well people who just want to be awed and lost in the grandeur of this planet for an hour or so.